BC Nature and it’s federated clubs, like the Nicola Naturalist Society, still plays a major role in supporting NatureKids BC, and most of the mentors who take the kids on outings are from BC Nature clubs. The new Merritt NatureKids club is being run by Crystal Wallace and Roxanne Wallace. If you are interested in enrolling a child or family please e-mail: merritt@naturekids.bc Membership is $25 per family per year. The new club recently had its first field outing – led by Nicola Naturalist Society member Tom Willms, the group went birding up the Nicola Valley. 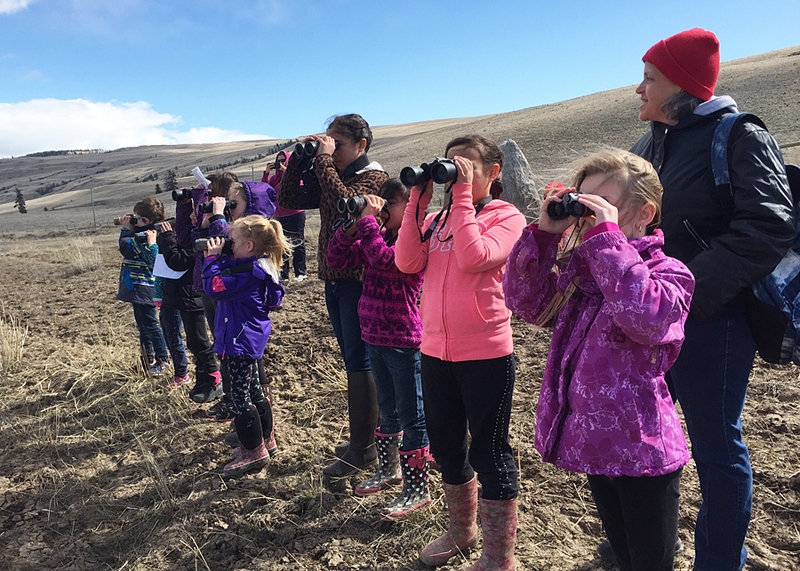 Members of the new Merritt NatureKids BC club on their first outing – birding in the Nicola Valley in early April. Photo courtesy Crystal Wallace. The Nicola Naturalists look forward to working closely with the new club and providing mentors to help build up a love of nature in these youngsters.